Judy Blume and Louis Sachar?! 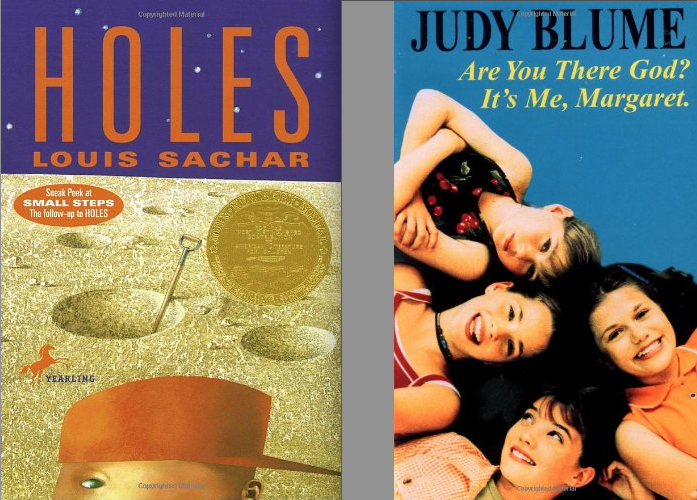 These icons of children's literature who win award after award for their books? They don't know if what they've written is any good--every time! Sachar goes on to say, "You forget--once everyone starts reading the book and liking it and you get the affirmation--you forget that, Oh yeah, I worried about that book too. And with every single book I've written, without exception, there's always a point in the middle where Oh, this book's totally wrong. I've gone this far, I might as well finish it, but..." (shakes his head). ...said the winner of the National Book Award and the Newbery Medal. In Kenower's lecture, he offered a reason for this. He said it's the same reason his math whiz sister took one try at writing fiction and came back and told him she hated it and would never try writing again. Why? Kenower said, "There is no formula and there is no right answer. That is the difficulty and the beauty of being a writer. We write to share our own version of the right answer. Our own unprovable truth. In writing (as author) you discover your authority." I love this. You write to find out your truth, to say what only you can say in this world. And that has no foolproof template to follow. Only you can find the way through. Much like the young heroes of our stories. A related thought that Sachar shares earlier in the interview is that he doesn't talk about what he's writing with anyone: "The story was just inside me and nowhere else, and day after day after day living with this story--it's like it's exploding inside me, but I wouldn't let it out except by writing. I think if I talked about it, it would take away that energy." I've been thinking about this idea a lot this past year in my own writing life. I used to be a planner and I thought I couldn't write without a perfect outline, without perfect vision for what lay ahead. But I've learned that my best writing is fueled by my own curiosity and a deeper trust in the work itself, which means not necessarily knowing what's going to happen when I sit down to write. I recently heard a writer say that talking about or planning out your story too much gives you the same psychological satisfaction as if you had already completed it, lessening your drive to write the story itself. I think this approach to writing is very related to the idea of writing to discover your truth without knowing whether your right answer will resonate with anyone else. When you write without a detailed outline, it's like setting out on the road without your handkerchief ala Bilbo Baggins. You don't know where the road will lead, and in many ways you're ill-prepared. But as the adventure sweeps you up into it--something greater than you, something wild and unsubmissive to civilized strictures--you discover who you really are, and what you're really made of. Turns out Bilbo's less of Baggins and more of a Took. Turns out mild-mannered Bilbo's actually a burglar, a riddler, and a trickster. Like Bilbo, we are changed by the stories we write, revealed by them, and that's a very vulnerable place to be. But it's your truth. Only yours. You can't be wrong. And that sets you free from the fear of being wrong. I've heard it said that all bad writing is rooted in fear. And while there is much to learn of craft, and little to gain from didacticism, I think that if we write our own unprovable truth, never knowing if the work is good or not, maybe that's what frees it to become great. Love this, especially after starting a whole book again from scratch for first-round edits! "There are no shortcuts to creation. The path is one of many steps, neither straight nor winding but in the shape of a maze." Joanna, I love this and this resonates with me: You write to find out your truth, to say what only you can say in this world. I started out writing without an outline and then moved into writing by an in-depth outline. While there was some discovery it was more rigid. I want to get back to more "discovery" in the process and see what comes - that is where the magic lies. And it's how I fell in love in the first place with writing my first novel - I want that place back where the magic resides. So I can relate! Oh how I would love to be a planner, theoretically. I tell myself I wouldn't have to go back and rewrite and rewrite and rewrite. In point of fact, I have a loose outline, but every day things come to me in the ACT of writing that wouldn't be there if I was doing a detailed schematic. It is like being in a maze--and my "muse" seems to like it that way. Thanks for this very inspiring post! I like to plan plan plan ahead, but of course in practice that "plan" always turns out to have gaps and mysteries, so writing the first draft is a Surprising Adventure, every single time.